Rubber bullets were fired at a crowd baying for the blood of a traditional healer who allegedly killed two children, resulting in a stampede. 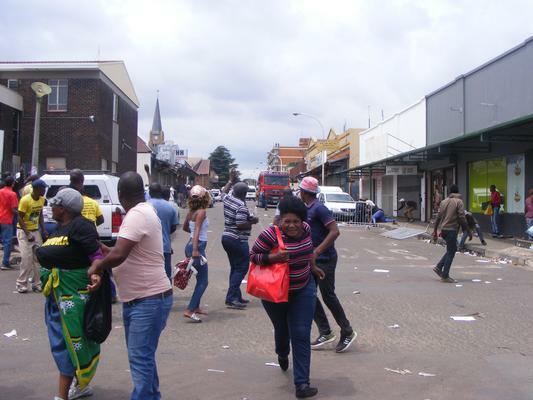 There were chaotic scenes outside the Witbank Magistrate’s Court in Mpumalanga on Tuesday when a crowd protested and demanded to kill traditional healer Thokozani Msibi shortly after he appeared in connection with the kidnap and murder of two children. The protesters gathered at the exit of the court and called on the police to hand Msibi over to them. Police were forced to fire rubber bullets to disperse the crowd and this resulted in a stampede. Some of the protesters retaliated and threw rocks and other objects at the police. Street vendors ran for cover and shops were immediately closed. It was not immediately clear how many people were injured, but the African News Agency saw a man with two open head wounds, while a woman, who identified herself as Dorah Mkhondo, also sustained several facial injuries. Mkhondo told ANA that she was walking to the local taxi rank near the court on her way to work, when a crowd of people ran and she fell and was trampled. “I was going to work and did not even know there were people protesting here. I lost my cellphone when I fell. My whole body is full of pain,” she said. The police could not immediately be reached for comment. Msibi, 32, appeared in court earlier for a formal bail application and his lawyer, Zamo Sibisi, asked the court to give his client more time to prepare for the application. The court granted the request and postponed the matter to March 6. Gabisile Shabane, a 14-year-old girl with albanism, and 15-month-old boy Nkosikhona Ngwenya, were kidnapped from their home in Hlalanikahle on January 28, allegedly by three men who entered their home after breaking a window. Gabisile’s body was discovered in Cullinan in the east of Pretoria and Nkosikhona’s was found on the side of the N4 highway early this week, said Mpumalanga provincial police spokesman Brigadier Leonard Hlathi. Msibi was subsequently arrested in connection with the incident.